It is important, therefore, to distinguish anxiety from an anxiety disorder. Anxiety is an umbrella term applied to the activation of the amygdala, and any subsequent thoughts or emotions. An anxiety disorder is a condition whereupon a person experiences the former in ways that creates distress. The former may be good or bad, but the latter is always bad. Evolutionary biologists posit that anxiety is a brain trait developed during the early years of man. In these primitive times, humans had to be on constant alert for all types of threats – and it was often a matter of life or death. Today, we know this as the “fight or flight” response. While we may not be fending off cougars or sabretooth tigers, external stressors in modern society can be formidable. 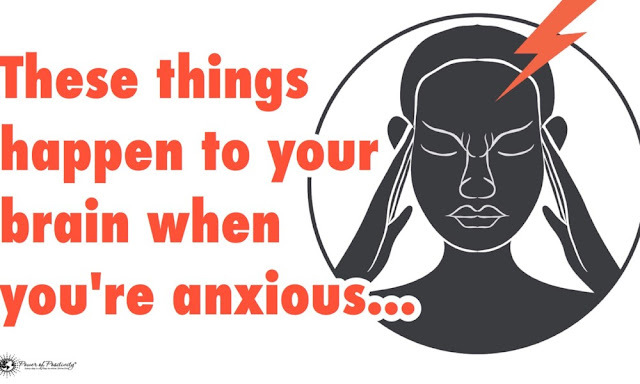 This segues into the topic of this article: what happens to the brain when it’s anxious. We approach this topic from both a physiological and psychological perspective. We’ll also discuss some coping mechanisms that professionals have suggested. What does this behavioral phenomenon do to the brain? Anxiety and overgeneralization effectually changes the brain’s structure – a physiological alteration known as brain plasticity. These alterations to the brain’s structure can be either positive or negative. For example, brain plasticity may allow a stroke victim to regain some or all of their previous functions. On the negative side, consistent exposure to stress may rewire the brain. In this case, these changes may result in a person living in a near-constant state of fear, anxiety, depression, and so on. Brain plasticity is often referred to as neuroplasticity within the medical community, and is defined as: “The brain’s ability to reorganize itself by forming new neural connections throughout life.” As early as 10 years ago, scientists believed that the brain’s ability to reshape itself had a fixed time window; this theory has since been disproven. The brain’s ability to structurally change throughout life is considered vital knowledge for the treatment of those suffering from both physical and mental illnesses. Indeed, the resiliency of the brain has – in many ways – revolutionized the treatment of conditions, from aneurysm to post-traumatic stress disorder (PTSD). According to the same study, anxiety can alter the brain’s plasticity, specifically in the areas responsible for regulating neuronal activity. As a result of these structural changes, people with anxiety-related conditions such as Generalized Anxiety Disorder (GAD) often perceive a threat when none is present. The brain is much likelier to initiate a “fight or flight” response under these conditions. Simply put, the brain is now on “high alert,” anticipating a threat and preparing to react. Researchers observed that “anxiety patients respond emotionally to new stimuli…even in irrelevant new situations,” attributing these responses to “a perceptual inability to discriminate.” For those with GAD and other anxiety disorders, this response is both involuntary and uncontrollable. Predictably, brain images taken of the two participant groups revealed noticeably-different activity. Functional magnetic resonance images (fMRIs) of the anxiety group revealed elevated neural activity, including in the primary sensory regions of the brain. The most conspicuous differences in brain activity were observed within the amygdala – an area of the brain responsible for the “fight or flight” response, and other associated, excitatory brain activity. As anxiety is a complex medical condition, recommendations for treating the condition are multifaceted. Of course, the most common form of treatment – as with most medical conditions – is prescription medication. Anxiety is a byproduct of intricate brain activity, and these medications seek to rebalance associated brain chemicals. Promisingly, natural treatment in the forms of meditation, Mindfulness-based Stress Reduction (MBSR), and even regimentation of nutritional and exercise habits have shown tremendous promise. More research studies continue to surface demonstrating the effects of MBSR and mindfulness meditation. Lazar has also participated in numerous research studies that correlate meditative practice with reduced stress and other benefits.